So today is the day of the annual Cat-Griz football game ... the University of Montana versus Montana State. I'm not going to weigh in on the thing, because as I've said I think big-time sports fandom is pretty silly. I think I'll just get the heck out of town for a few hours to escape some of the nonsense. That said, I suppose I could compare the two schools in some other way ... though for my own safety I won't go so far as to say which of the universities is the better one. Instead, as an historian and an architecture fan I could compare the campuses. Both have a number of extremely handsome old buildings and thoroughly nondescript newer ones, and both have coldly destroyed some of their landmarks ... though overall I think UM has both the best architecture, and some of the worst. Both of the schools originally had campus plans designed by Cass Gilbert, one of the most noted of twentieth-century architects ... and both schools have thoroughly erased many of those lovely landscapes with really unfortunate new construction. MSU's behavior has been particularly egregious in this regard. But the most telling thing is a look at the focal points of the two campuses. Montana Hall at MSU barely stands out at all, with the new buildings overshadowing it and the erratic landscaping ... and the fact that the school's awful-looking pedestrian mall runs along the back of the building, so that's all that most people ever see. The UM campus couldn't be more different -- their Main Hall is the keystone of a huge grassy oval, and is backed by a mountain with a giant "M" on it. And at the other end of the oval there's a giant bronze grizzly. It's all gorgeous, and couldn't be more perfect. Though they'll never admit it, the MSU people have been insanely jealous of the oval and that grizzly for a very long time ... so this year they set up a big metal bobcat on a nondescript plaza at the Bozeman campus. It's a pale and obvious imitation, and actually kinda sad. So even if you don't care about football, now you know which campus wins. Cass Gilbert - cool! He designed the Minnesota state capitol (he was from St. Paul, I think, or thereabouts. 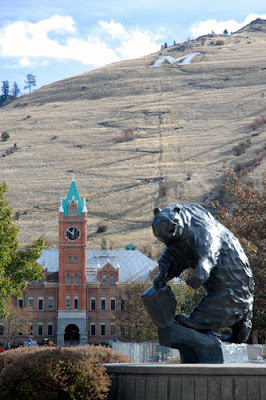 For a truly horrendous Montana university campus, architecture AND landscaping included, Eastern (or MSU-Billings) gets my vote. Yep, Gilbert designed a number of very well-known buildings, including the Woolworth Building in New York, and the U.S. Supreme Court Building. And Eastern's campus is indeed really awful ... and the one at Northern is only slightly better. I kind of like Western's little campus, though, and their Old Main building is the coolest college building in the state.